I joked last year about how my husband was trying to convince me to view the yearly explosion of dandelions in our yard as a “harvest season”. Ahem. Last week the members of our church small group came over to our home and my dehydrator was busily whirring away in the background. A friend asked what I had going in there. Face reddened, I admitted that I was drying dandelions. I’m already known as the kooky, health extremist in my church. I think I just sealed my fate, and will forever be known as “the one who eats all sorts of really weird stuff”. What are the benefits of dandelions? This is a fancy way of saying that they have lots of great nutrients in them, such as beta-carotene, Vitamins C, E and K, as well as many B vitamins (1, 2, 6, 12), and minerals such as calcium, iron, magnesium, phosphorus, sulfur and zinc. They may also contain vital trace minerals such as copper, cobalt, boron and molybdenum. They have many uses in natural healing. They are abundant and free! Never thought you would be happy to see them rear their yellow heads each spring? Now you can enjoy going out to your yard and picking them with relish. Instant weed control AND a way to gather medicinal herbs, all in one. Beautiful, right? 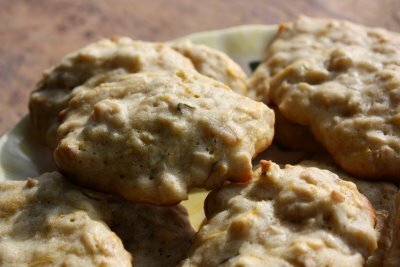 Foraging for wild foods like dandelions is definitely a frugal food option and a valuable way to add a nutrient-dense ingredient to your kitchen. I am not yet an expert as this is my first year to actually take advantage of the harvest right outside my back door. So far, I have dried many leaves for the purpose of using in homemade herbal teas. The main trick is to make sure you pull off just the flower and not any of the green stem, because that is where the bitterness begins. If you pop off just the flower top, there should be no bitter taste. Harvest in fall (try to find large, well-established plants). Roots can be dried and roasted then ground up to be used as a coffee substitute. They are a common ingredient in many herbal/grain coffee substitutes in health food stores. 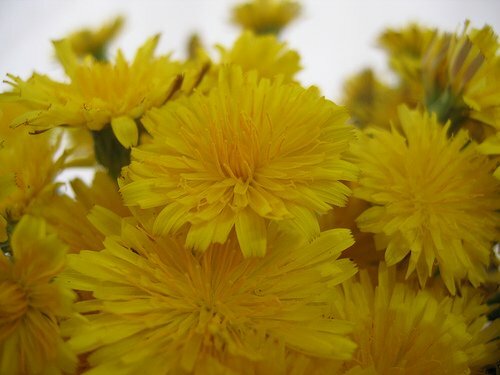 Have you picked and used dandelions as a food or nutrition source? What are your favorite ways to use them? I remember years ago my sister telling me you could make a salad with the leaves, and I did, but only one time. And just a few days ago I noticed them popping up in my front yard and explained to my six-year-old son that some people think they’re weeds, but they’re herbs, and very good for you. I’m definitely going to pick them now, and try some of your ideas! Thank you for this wonderful post. I must admit that I am so thankful that I am not the only person that is viewed as kooky. LOL! Somehow just knowing this makes me feel better about all the “strange” stuff I do. Thank You! This post has opened my eyes to new foraging opportunities! I’ve been paying a lot of money to buy those plastic containers full of mixed salad greens, which include dandelion leaves. I also plan to forage for nuts in the fall, as have found some local nut trees. We’re also blessed to have wild garlic growing just beyond our back fence. I’m very interested in your plan to make dandelion tea, as I try to use natural remedies in my home, rather than prescription medications. This has been a helpful post, thank you! I’ll have to get picking! .-= Laryssa @ Heaven In The Home´s last blog ..New Creation =-. I’ve been using some in my green smoothies! I’ve heard that banana’s mask the bitterness. I didn’t know that the flowers weren’t bitter! Thanks for the post I’ve been wanting to do more with them! I’ve been wanting to try this since I read about it in “French Women Don’t Get Fat,” but having lived in an urban city I’m always wary of dandelions. Especially as I walk my dog and see him use them as a potty post. I may have to get further into the country to feel comfortable picking and using them! Thanks for the other uses, though, as I’m not a huge salad fan in general! 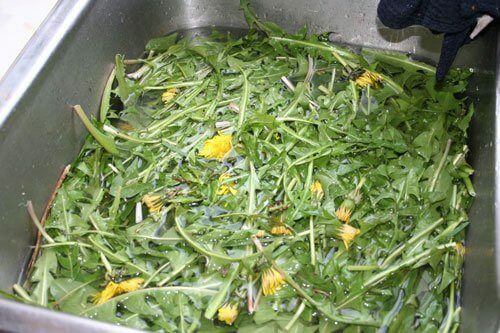 When I was little and we had just moved to a new house, my great grandmother came to visit, saw the yard covered in dandelions, went out and gathered a whole bunch of greens and cooked them. It’s an Italian thing. We call it ‘poppona’–saute the dandelion greens with a lot of garlic and olive oil, toast the bread in the pan and serve together. @Tara V, I think they would be helpful for the liver in both tea and in smoothies! I started making dandelion jelly last spring. We love it in our house. My daughter and I even made a batch and canned it in the small jelly jars and gave it out at her “farm yard” birthday. Some people thought it sounded fantastic and others were skeptical, but everyone loved it! I haven’t had the leaves in years. I remember my grandmother putting them in her salads and thinking I didn’t like them because of how bitter they were. I would like to try them again this summer though. I love the idea of hiding them in our green smoothies with the bananas and other fruits (blueberries hid the color so my son doesn’t turn his cute little nose up at the smoothie with the spinach, it would work with this too eh?). Another little tip about dandelions is that they become more bitter in late summer/fall. They are best in spring/early summer. .-= Christy´s last blog ..Happy Easter! =-. .-= Mandi´s last blog ..busy =-. Okay, so I’m a nerd and I got super excited by this. I went on a walk today with the kids and there were TONS of dandelions (we don’t have any yet). We got a basket and picked a bunch. I’ll try the cookies and not sure what else with the flowers. The leaves are already in the dehydrator. I’ll keep picking them and keeping them for teas in the winter. Also on my radar are the cherries growing around the neighborhood near the street (public property!) and elderberries. I hear they’re easy to grow. Just have to find a way to plant some now! .-= Kate´s last blog ..Baby Steps in Personal Care, part 3 =-. The dandelions attract bees for pollinating the fruit and vegetables. I love them for that reason as we have hives and they need food. No longer will I pull out the dandelions. I have used the roots for tea, a detox type tea and the flowers I would like to learn to use. I think a dandeloin wine would be nice. Loved this post on dandelions, as I was just looking for some while I was out walking to plant in my herb planter! =) I am currently enrolled in a Christian coorespondance school called Vintage Remedies and am taking their Family Herbalist program. I am a new mom of a 4 month old and want to learn how to treat him naturally. I could not be more please with this program, as you are able to move through it at your own pace. It’s been wonderful to be able to study herbs from a Christian perspective! Guess what I found in the local Sobey’s (grocer) last week!!!! I wouldn’t have even noticed, except that my son was perplexed by the bunch of mint leaves. I reached over to rub one of the leaves to show him how fragrant they are- and there I saw between the parsley and mint they were selling bunches of dandilion leaves! I am still in shock- I have bushels of them in the back yard every year! I should let my FIL know- I’m sure he’d be more than happy to be a supplier! They have a whole farm full of dandilions! I love this post! I’m definitely known as a kooky person who experiments with all sorts of herbs and food. I agree with the others, it is good to know that I’m not the only one out there that gets excited when I see dandelions popping up in my lawn! .-= Katie´s last blog ..Yucca Flower Stir Fry =-.